Wedding season is here! I’ve already been to a few, and still have another big one to go. As a notorious dress disliker, figuring out what to wear has always been a chore, but lately I’ve been playing with fun pant and suiting combinations that feel much more “me”. I wore something very similar to this to a wedding earlier this year, and then almost the exact same outfit to a baby shower. It’s been fun, a little cheeky, and very me. 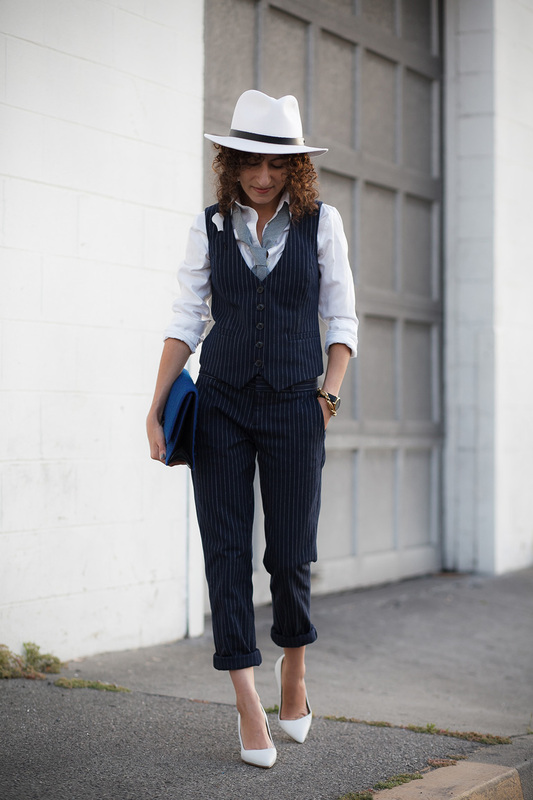 If you’re looking for wedding guest outfit ideas, let me suggest a suit! You’re a guest at a casual, artsy, or Southern wedding (seersucker, anyone?). You’re a guest at a black tie wedding…who doesn’t love a good lady tuxedo? The location or venue will be chilly. You won’t be shivering in your cozy crop pants. Add heels. What’s easier to feminize a look than with a great pair of heels? Leave the look “undone”. Unbutton the neckline. Roll the sleeves. Cuff the pants. 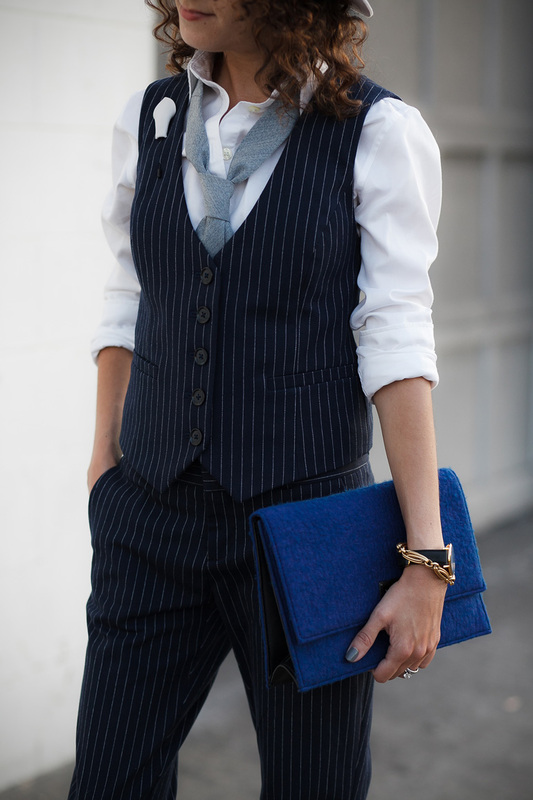 Forgo the jacket but wear a coordinating vest. Wear your hair and makeup softly. To avoid coming off severe, opt for a softer, feminine hair and makeup look. Accessorize with a few of your favorite things. In my case, that’s a bright and fun handbag, a few favorite pieces of jewelry, and a fun tie made and proportioned especially for women. 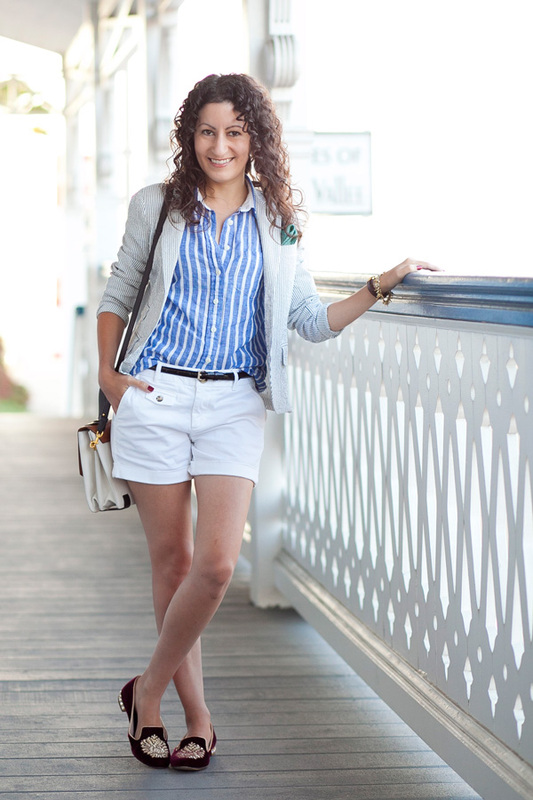 This one is the chambray, but it also comes in a cute blush and khaki for summer. A special thank you to Georgia Mae for their sponsorship & support. Very dapper! You look as stylish as ever. I’ve spent so much time trying to find a dress I didn’t hate. I thought about going with a pants-based outfit like yours, but it’s so similar to what I wear to work and I like my wedding/occasion attire to feel special. I think most women who wear dresses look terrible in them, but I finally found one that works for me! Any chance you know of a similar style suit which can be bought this year? I am going to a wedding in June and really fancy feeling comfortable. I kinda hate dresses. I love this look but can’t find anything similar – based in the UK. Any help would be greatly appreciated..